As the weather forecast was so bad for the weekend, we ruled any boat fishing out straight away. We decided to try a venue where in the past we have been "plagued" by Pike of various sizes while fishing for Tench and Bream. With the pit dug out and high banks around the perimeter, you can get out of the worst of the weather/wind. Neil lives close to Booton, So I set off at half six to collect Dean on the way. As i arrive outside Deans house i get that feeling of "Deja Vu". No lights on, No sign of movement, Nothing. I try the phone, straight to answer phone, i think of ringing the doorbell but decide against it, don't really want to upset his landlord. After about 15 mins i head off and leave him a text to wake up to. I arrive at Booton and Neil has already started unloading even though its still quite dark. We choose two swims on the road side bank, nice comfortable stagings and also sheltered from the howling wind. The club rules do not allow Live baiting here so its dead baits all the way today. We both set up two rods, one straight ledger and the other a float ledger. 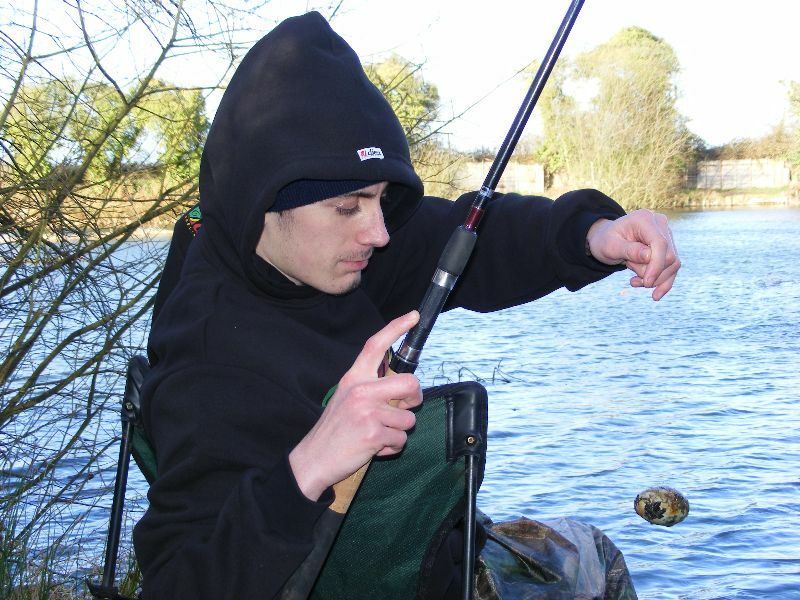 Neil positions his dead Bluey close in to a reed bed and its no more than Five minutes before its taken. A nice positive run results in a 6lb fish on the bank. This has happened before he has had time to bait up his second rod ! 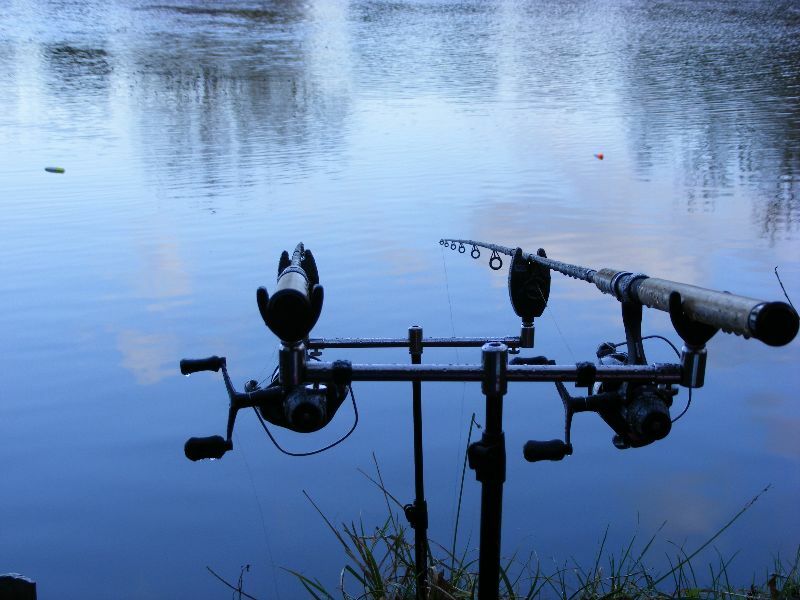 This is an encouraging start and I get both my rods out and gear sorted for the day. The next hour passes without any interest from anything except the wind. Its starting to really gust now and the alarms "Bleep" now and then as the wind catches the lines. I decide to make a brew but discover ive left the water at home ! I then get a call from Dean who has slept through two alarms and the his phone. The landlord kindly woke him after hearing his alarm going off for half an hour at 6am on a Sunday ! Bet he was impressed ! I decide to nip home for the water and collect Dean on my way back. This takes about 45 minutes but still no more runs have materialised while ive been away. 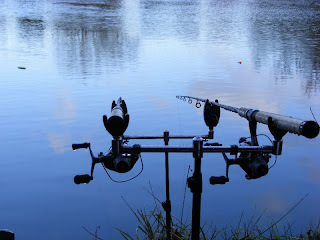 Dean decides to set up a float rod to catch a few small fish to break the boredom, but even this seems hard work today. You normally cant put a bait in the water here, otherwise its taken instantly. Eventually he starts catching small Roach and Perch until he lifts into a better "Fish". As he eases the rig out of the water, we are gob smacked to see what's hanging on the hook. Its a full size, empty, Hens egg !!! Hooked neatly in a small hole in its side. The sight of the egg reminds us we at least have a nice lunch to look forward too, Crispy Bacon rolls ! I prepare the stove and pan and start to cook the bacon, but the wind has other ideas and continually blows the stove out every few seconds. We shield it with every item on luggage and spare kit we have but still the wind is determined we go hungry ! It takes me about 45 minutes just to cook our food today, a job that normally only takes 15 minutes at the most. 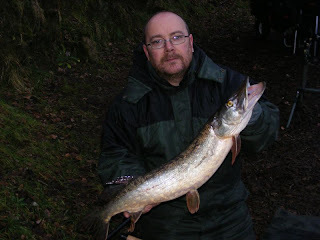 We change our baits and rigs to try and find another Pike from somewhere but we end the day with just Neils fish caught after only 5 minutes ! 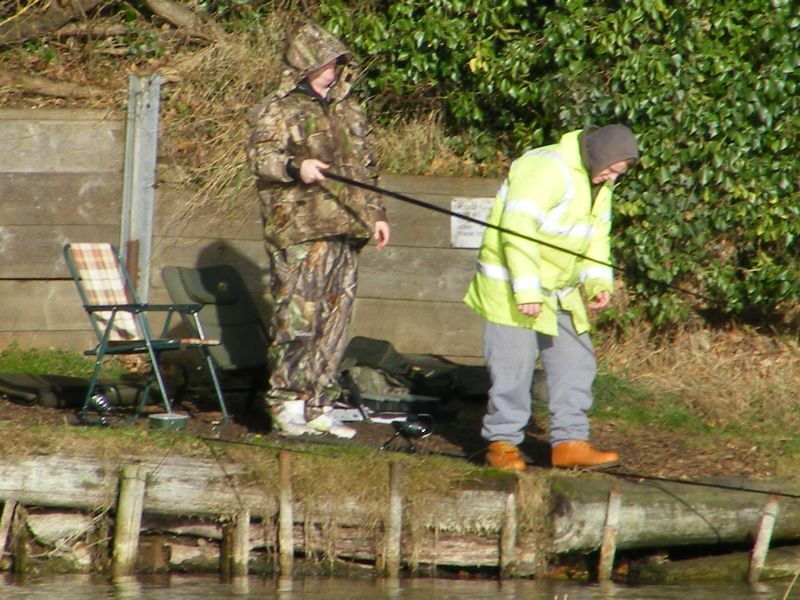 Just as we are thinking of wrapping up and heading home to watch the football, Two more anglers turn up and walk round the far side and start to set up their gear. 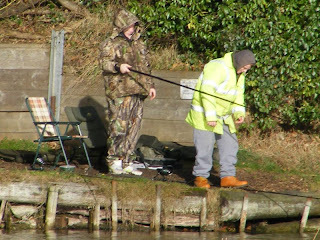 As the sun is now out in force we are sitting there almost blinded by one of the anglers new "Nash camouflaged jackets" . As none of us had packed our sunglasses, we decide to pack up and go before we suffer any "Snow Blindness" from the glare.